Several hundred fans showed up for the Huskies' showcase at Dempsey Indoor and watched Dotson run a 4.32-second 40-yard dash, improving upon last year's team-leading 4.38. Jomon Dotson, for one, is jumping higher and running faster this winter. The senior cornerback retained his title as the Huskies’ fastest man during the Husky Combine winter conditioning testing drills Saturday afternoon. Several hundred fans showed up for the showcase at Dempsey Indoor and watched Dotson run a 4.32-second 40-yard dash, best on the team and an improvement from his team-leading 4.38 a year ago. Dotson also had the top marks in the vertical jump, at 40.5 inches (a one-inch improvement from last year) and the broad jump, at 11 feet, 1.5 inches. Junior safety Taylor Rapp and junior cornerback Myles Bryant had the most impressive results of the day in the pro agility 20-yard shuttle. Rapp also had the fastest time on the team in the three-cone drill (6.57 seconds), which would have ranked in the top three among safeties at the NFL combine (top time there was 6.56). 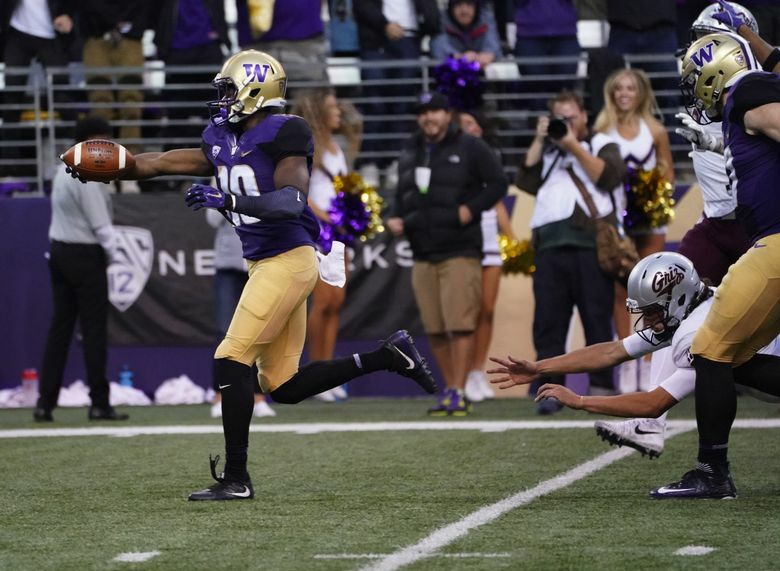 The Huskies make public only the top five performances in each drill. One surprise name that popped up: Colson Yankoff, the quarterback from Coeur d’Alene who graduated high school early and enrolled at UW in January. Yankoff had a top time (6.75) in the three-cone drill.